Apple looks to be plotting another architectural marvel with its new Madison Avenue store in Manhattan, as the iPhone maker has turned to the same team of architects and engineers responsible for many of its most iconic outlets. 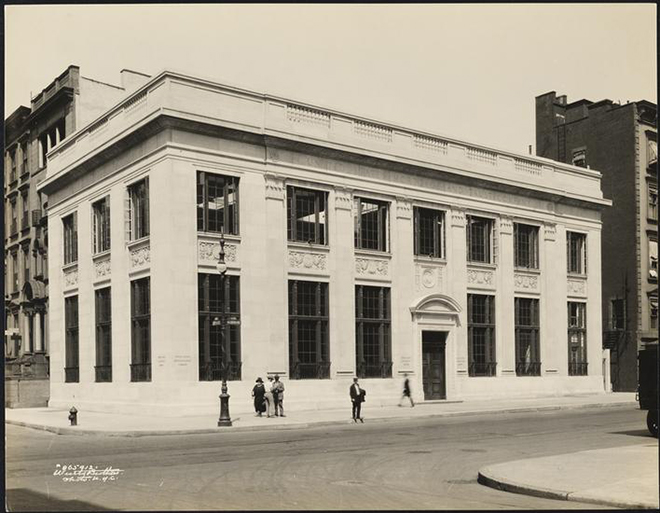 Longtime partners Bohlin Cywinsky Jackson and Eckersley O'Callaghan have been brought in to revamp the 93-year-old former United States Mortgage and Trust Company building at the corner of East 74th Street and Madison Avenue, according to New York City building permits. The permits were first discovered by ifoAppleStore. Both firms have deep ties to Cupertino, Calif.-based Apple. Bohlin has been the architect of record for every flagship Apple store since the chain's inception, from the famous Fifth Avenue cube to the new Stanford store in Palo Alto with its cantilevered steel roof. Eckersley, meanwhile, have had an equal hand in crafting Apple's retail empire. They worked side-by-side with Bohlin on the New York stores and others around the globe —including Shanghai's glass cylinder and London's massive Regent Street store —providing critical expertise in structural glass engineering. Notably, Eckersley was also responsible for the innovative use of glass in late Apple CEO Steve Jobs's Philippe Starck-designed superyacht. The ship features structural glass walls up to 40 feet in length, a first in the yachting industry. Apple has just begun a $60,000 interior demolition on the new store, the permits indicate. The company is thought to be targeting a 2015 opening.